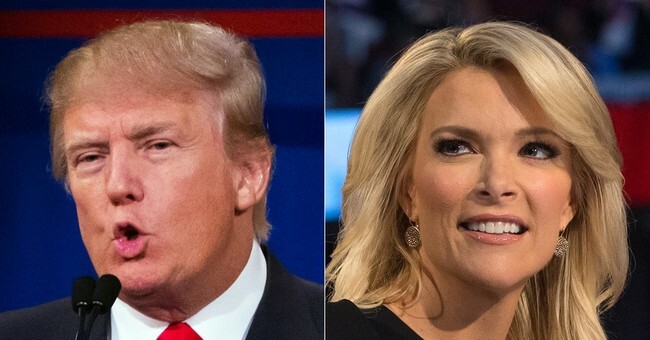 Megyn Kelly Responds to Trump: "This is a Tough Business and It's Time to Move On"
In case you missed it over the weekend, Donald Trump told CNN during an interview that Megyn Kelly had "blood coming out of her eyes and blood coming out of her...wherever" during the first GOP presidential debate. Those comments prompted Erick Erickson to disinvite Trump from addressing the 2015 RedState Gathering in Atlanta after the Trump campaign first denied the comments were made, refused to clarify and then claimed Trump was talking about Kelly's "nose." Last night on The Kelly File, Kelly addressed the comments for the first and the last time. "You may have heard that there was a dust up including yours truly and presidential contender Donald Trump. Mr. Trump was upset with a question I asked him at the debate last week about his electability and specifically comments he has made in the past about women. A few words on that: Apparently Mr. Trump thought that the question I asked was unfair and felt I was attacking him. I felt he was asked a tough but fair question. We agreed to disagree. Mr. Trump did interviews over the weekend and attacked me personally," Kelly said. "I've decided not to respond. Mr. Trump is an interesting man who has captured the attention of the electorate. That's why he's leading in the polls. Trump, who is the frontrunner, will not apologize and I certainly will not apologize for doing good journalism. So, I’ll continue doing my job without fear or favor, And Mr. Trump I expect will continue with what has been a successful campaign thus far." "This is a tough business and it's time now to move forward. And now, let's get back to the news," Kelly continued. Trump is still refusing to apologize for his remarks and has been on a Twitter tirade against Kelly for days.